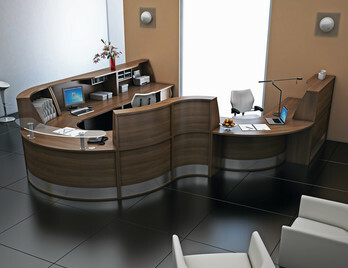 The Avalon reception desk range is the most comprehensive, practical, modular range on the market. With numerous bases, top units and shelves the Avalon range can be planned in endless configurations to best suit your reception area. In this section, a number of popular configurations are available, and if necessary, we can make bespoke sized base units and countertops. You can choose between high and low countertops or MFC and glass shelves for added privacy when signing in. There 17 board finishes available with an extra 4 modesty panel finishes. Avalon is not only impressive from the visitor's side, the countertops are designed to house storage units, pigeon holes, key lockers and CD racks, keeping everything organised and tidy. 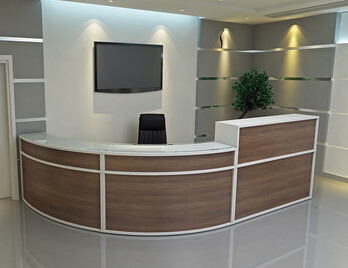 Avalon reception desks comes with free delivery and installation across mainland UK. This compilation is popular as it offers a symmetrical solution, with high raised countertops on each side. Files can be stored in the countertops offering neat storage solutions. The glass shelf also sits elegantly on brushed aluminium posts offering a suitable area for visitors to sign in and out. This compilation is shown with a silver kickplate which protects the base from potential scuffs and marks. 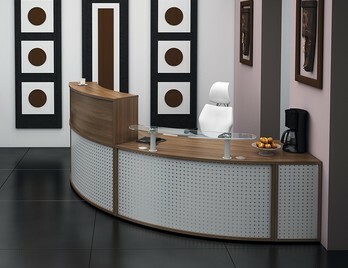 A free professional delivery and installation service is included within the price of this simple yet stylish reception desk. This compilation is one of the larger configurations comfortably seating 2 to 3 people. The central lower glass shelf allows a welcoming view for the visitor with the higher sides reserved for extra monitors or files. This desk is one of the larger compilations measuring 4000mm across, offering multiple touch down points. Shown in the attractive subtle Santiago Cherry finish. You can Choose from 17 other finishes for the base and counter unit front panels. This compilation works really well as it offers a good degree of privacy whilst retaining an open aspect. The working space behind the desk is also conveniently spaced out by the desk high pedestal drawer unit. This compilation does not take up a large footprint and could be described as a medium size desk. This combination can be configured the other way around if necessary, we can provide 2D and 3D drawings to help visualise the desk in your designated area. 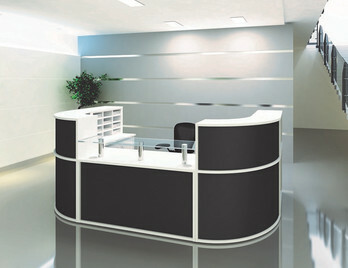 A contemporary U shaped reception desk layout with a contrasting front panel and desktop finishes. This desk offers the user an encompassing working area with a stunning glass shelf supported on brushed aluminium posts. A base unit cupboard is also incorporated into the side which with a 12 compartment pigeon hole above unit which is conveniently placed behind the countertop. This desk is ideal for those wanting to organise and keep a number of files and paperwork close to hand. 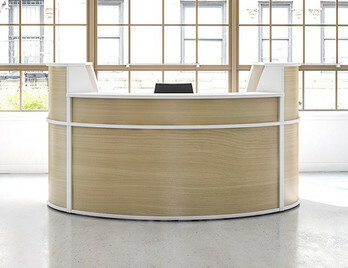 This large reception desk really encompasses what the Avalon range can offer. 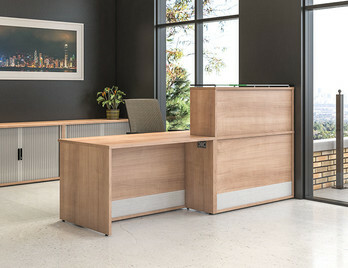 The desk is made up primarily of two ergonomic radial desks offering a large working area with a two desk high pedestals. A useful meeting end is also attached securely to the 90-degree section offering a unique and practical surface for visitors to possibly complete forms or paperwork. The teardrop meeting end is also very practical for wheelchair users meeting DDA regulations. 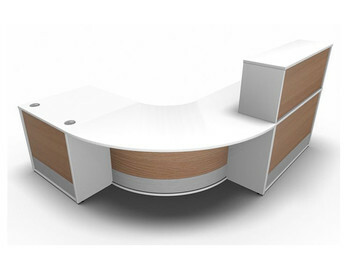 This reception desk is ideal for a high tech or modern office as the straight edges and linear lines give more edge than it's counterparts. The symmetry of the desk will appeal to both users and visitors who will be greeted over the stylish glass counter shelf. The two-tone contrasting wood or colour panel add to the simplicity of this setup and can enhance and add to an organisations branding scheme. The desk is anchored by two square corner pillars with useful cable management holes to feed all wiring through. 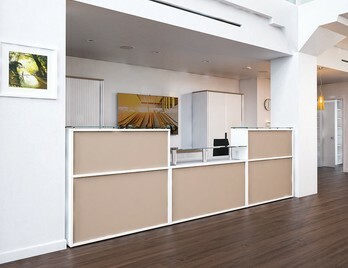 Large modular reception desk showing two two-tone front finishes. Includes under counter storage and a desk height access area. This is a modular system and many other options are available. 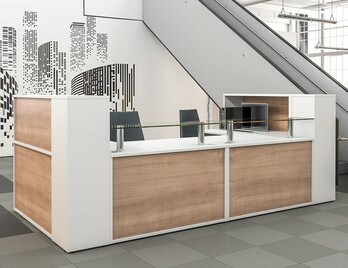 This modular reception sweeps around from the rectangular base section and gives a generous working area for the receptionist. The desk is further enhanced by the lowered glass mounted counter top which offers a degree of privacy whilst being able to retain eye contact with guests and visitors. The two-tone aspect if required can also work well with anthracite and white being a popular combination. 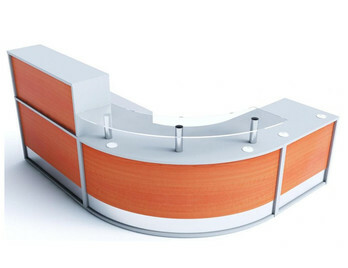 90-degree reception desk showing a curved recessed area to facilitate wheelchair access. Desk height and counter area. A large range of solid wood colours and wood finishes are available to suit your area. 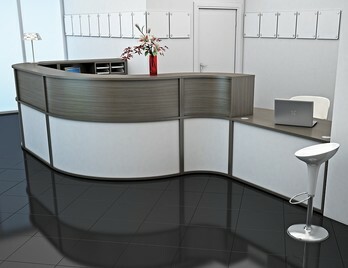 Reception desk composition from the Avalon range with a recessed front panel to aid wheelchair access. Choose from 19 matching or contrasting front panel colours. This is a modular system that will suit all areas. Please take advantage of our free design and space planning service. 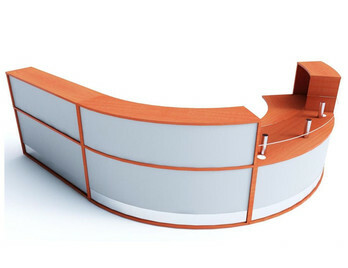 Large reception desk with feature curved glass shelf. Highlights some of the contrasting finishes available on the front panel and desk area. This range is manufactured in the UK and delivered in 2-3 weeks from order. 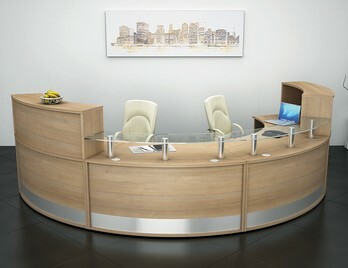 Large curved reception desk with feature glass shelf and Chrome pillar support. Fronts are available in a choice of 19 finishes. Free design, free delivery and free installation. Comes with a five-year factory guarantee. 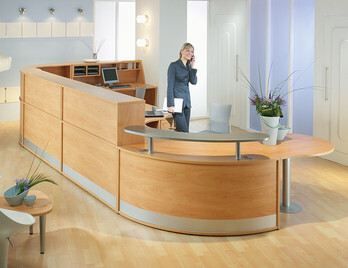 Straight reception desk from the Avalon range with a central recessed area for wheelchair access. Contrasting finishes for the carcass and front panel. Comes with a wide selection of sizes to suit all areas. 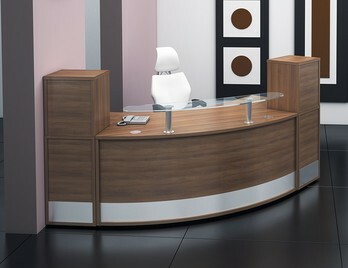 These accessories can help organize and enhance the receptionists working environment at hardly any extra cost and can be fitted easily making the Avalon reception desk a sensible choice for a sensible price. Alternative low - level glass shelves on steel supports offer a more open and inviting approach to the desk allowing the user and visitor to clearly see each other without being obscured by high counter modules often seen on more traditional budget style desks. The Avalon budget reception desk also responds well to DDA requirements (Disability Discrimination Act) by offering low modules for wheelchair access and recessed panels to allow the wheelchair user to write or rest upon the desk top on either side. Because of these flexible modular solutions we have supplied the Avalon reception desk to Dental Surgeries, Care homes, Swimming Pools, Schools, Universities and numerous Business headquarters. With businesses now looking at innovate ways to save money they may well look at ways to save space within their premises as property and letting has risen to new heights. With reception areas becoming more compact due to these constraints the Avalon range again has responded satisfactorily to consumer demand by offering 600mm deep units instead of the standard 800mm deep units. With most offices already using flat screen monitors, there is no need for 800mm deep desking making the Avalon 600mm deep range a superb choice in these current times. If you need help planning your reception area using the Avalon range (or any other range) please do not hesitate to contact our in house design team who can produce 2D or 3D drawings showing every last detail and finish. These visuals will be backed up by a competitive quotation. If you need to see the actual wood samples used on the Avalon reception desk just ask as they all come within a glossy A4 booklet and we can post them out for next day delivery. Finally, this range comes with a FREE INSTALLATION SERVICE. Our experience team will deliver and assemble the reception desk in the designated area and remove all protective packaging leaving you with a quality reception desk ready to impress visiting clients and enhancing your staffs working environment.